We waited for the perfect combination of a weekday with good weather before things got too crazy to visit New Orleans. Yesterday was the day. With the Frommer's one-day itinerary as our guide, we set out on a walking tour of the most famous of districts in the Big Easy: The French Quarter. We started our tour by picking up café au lait and beignets at Café du Monde. 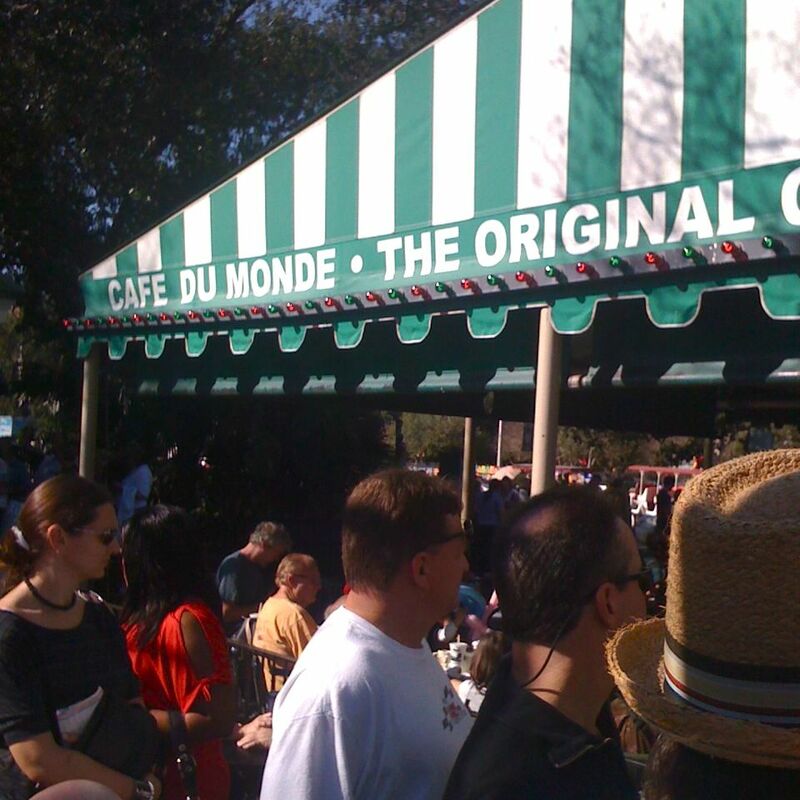 This New Orleans original was packed. There was powdered sugar everywhere! We enjoyed our breakfast across the street in Jackson Square, which is named after "the hero of New Orleans", Andrew Jackson. 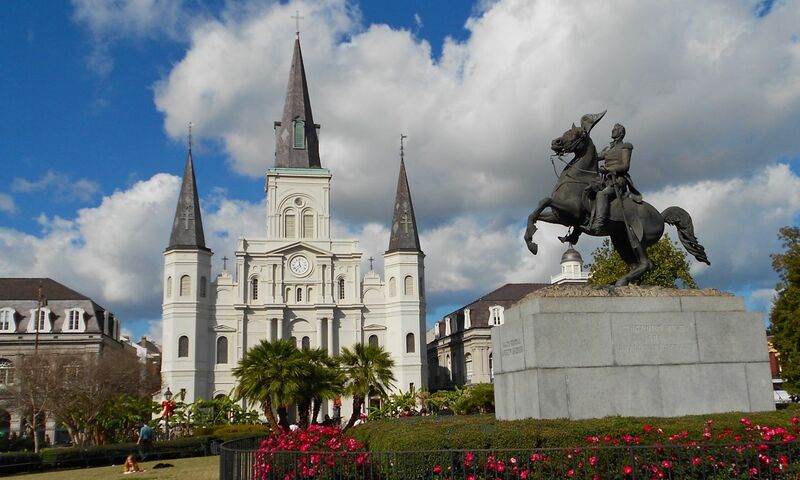 Bordered by beautiful St. Louis Cathedral, this common area attracts artists and street performers. Tonight, thousands of revelers will gather here to watch "Baby New Year" drop from its perch atop Jax Brewery as they ring in the New Year. 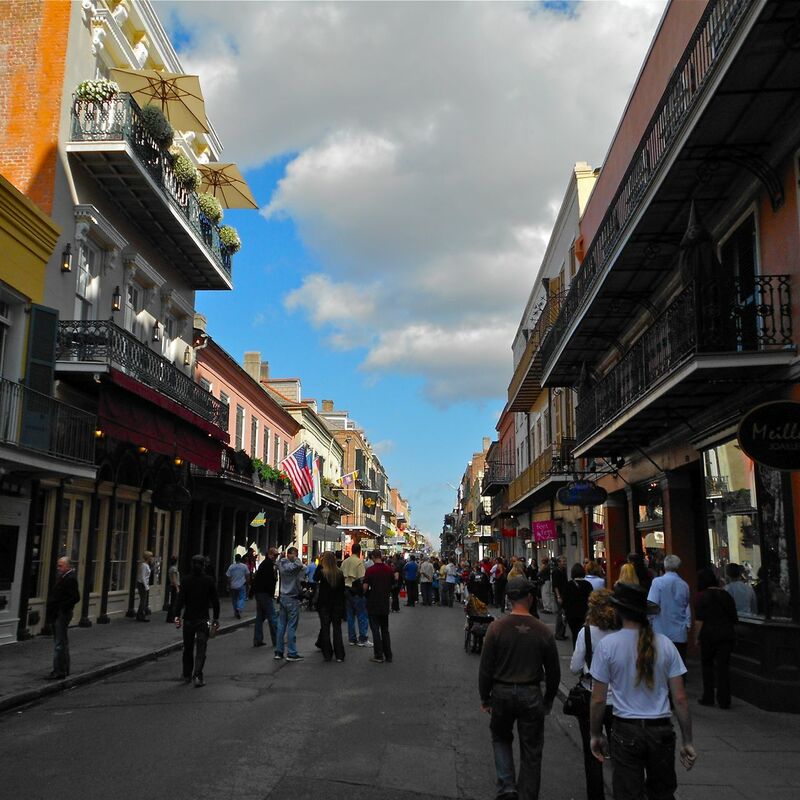 The French Quarter, also known as Vieux Carré, is the oldest neighborhood in New Orleans. 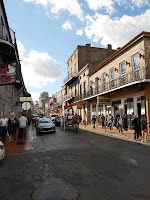 The entire 78-block district is a National Historic Landmark, where property owners have worked diligently to preserve and maintain the original French and Spanish architecture. 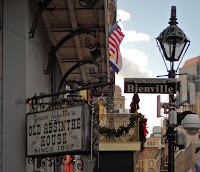 At Bourbon Street and Bienville sits the Old Absinthe House. This corner bar has been serving up libations since 1807. Absinthe, of course, has long since been outlawed. It caused madness and blindness! 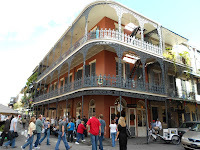 It was before noon before we strolled by most of the Quarter's famous watering holes, so we didn't stop. But, there were plenty of tourists walking the streets with their hurricanes and daiquiris in "go cups". Mardi Gras season kicks off around here in a week or so. 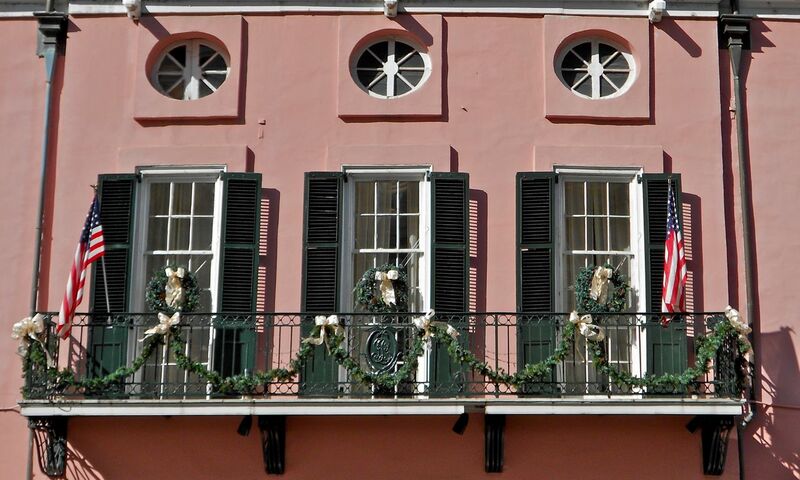 From the Feast of the Epiphany until Shrove Tuesday, it's party time in the Quarter, when partiers fill the balconies and galleries above Bourbon Street and others. We spent a couple of hours wandering the streets. And, we weren't alone. 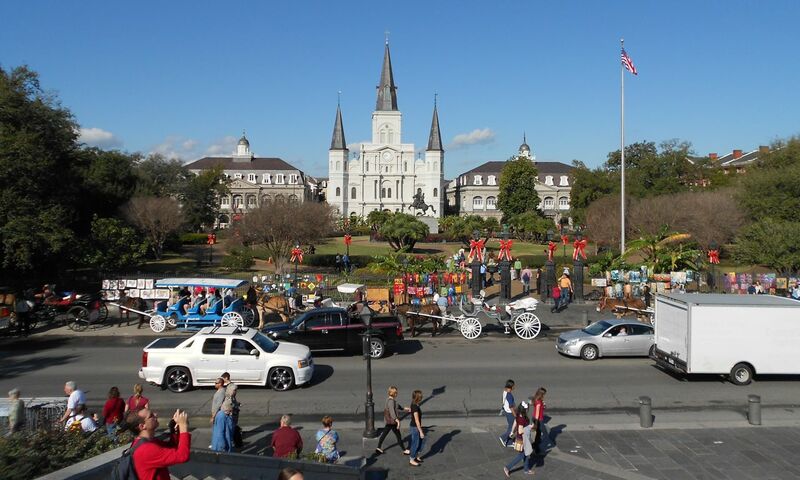 In addition to its New Year's Eve celebrations, New Orleans is hosting an NFL playoff game and the Sugar Bowl this week, and the BCS Championship Game next weekend. There are lots of visitors here who are ready to celebrate. 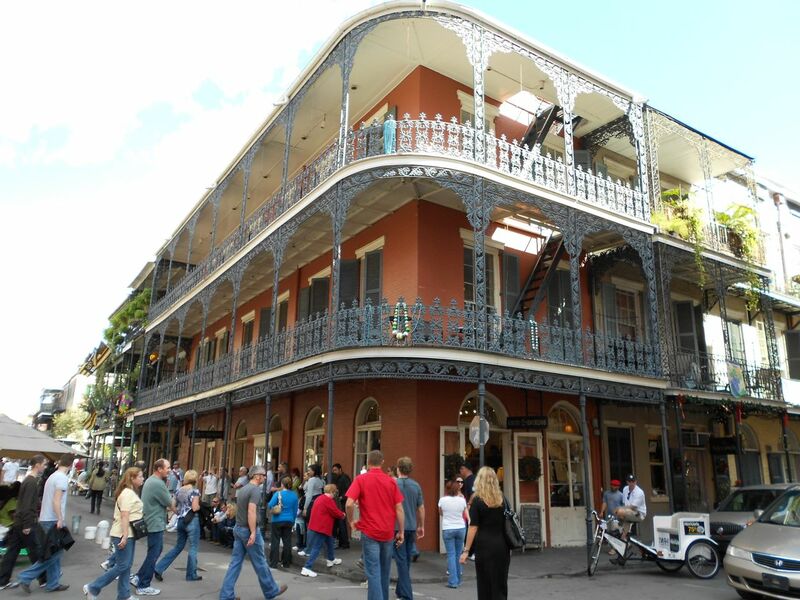 Between the architecture and people watching, there are plenty of sights to appreciate in the Quarter. It's also something to hear. 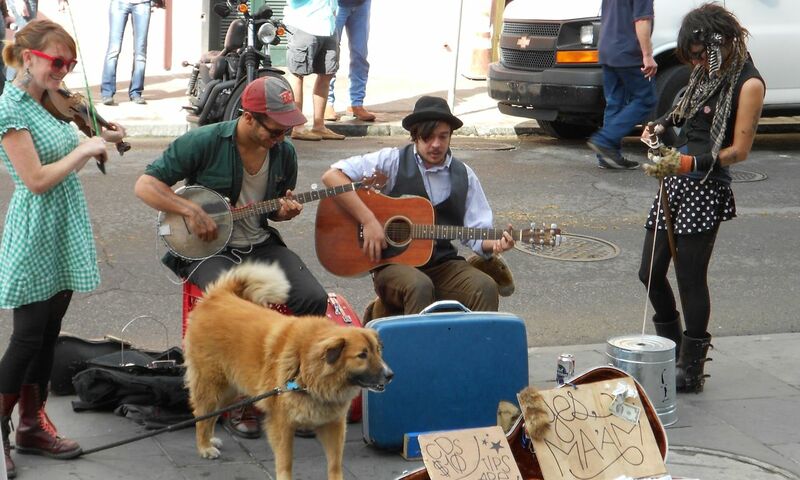 Jazz and Cajun music spills from bars and restaurants into the streets. This quartet was quite fun. By mid-afternoon, the Quarter was filling up and we were getting hungry, so we made our way toward the mighty Mississippi to have our first taste of another New Orleans original. 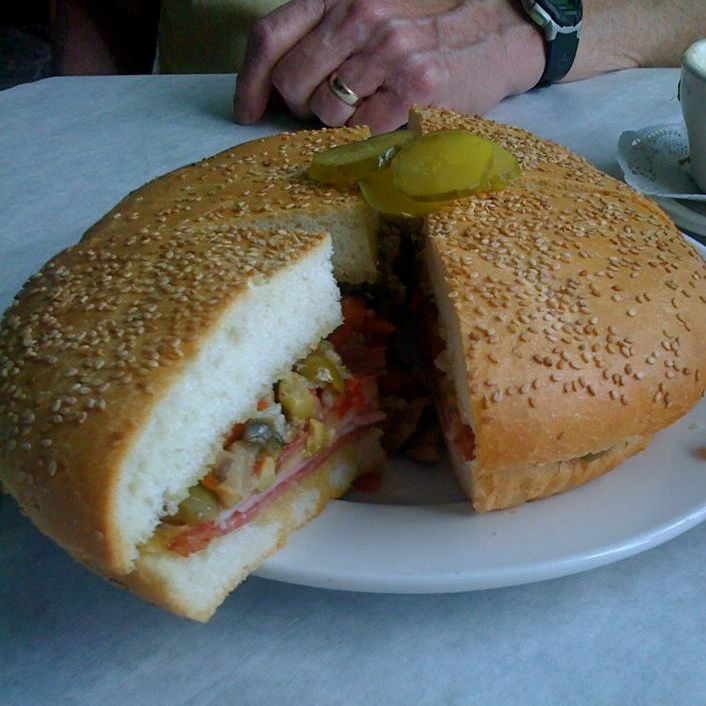 Meet the Muffuletta! This monster of a sandwich originated at Central Grocery, which was our intended destination. But, the lines were long and we desperately needed to sit for awhile, so we stopped a few doors down at Frank's. At our quiet table for two by the window, we shared three-quarters of this massive loaf containing sliced meats, cheeses and wonderful Italian olive salad. It may not be the original, but it sure was tasty! 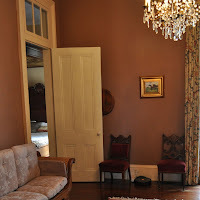 After our fun and food-filled day in the French Quarter, we made our way back to the plantation. After a very light dinner, we had a nice visit with Wendy, Brad and Brady around their portable campfire. 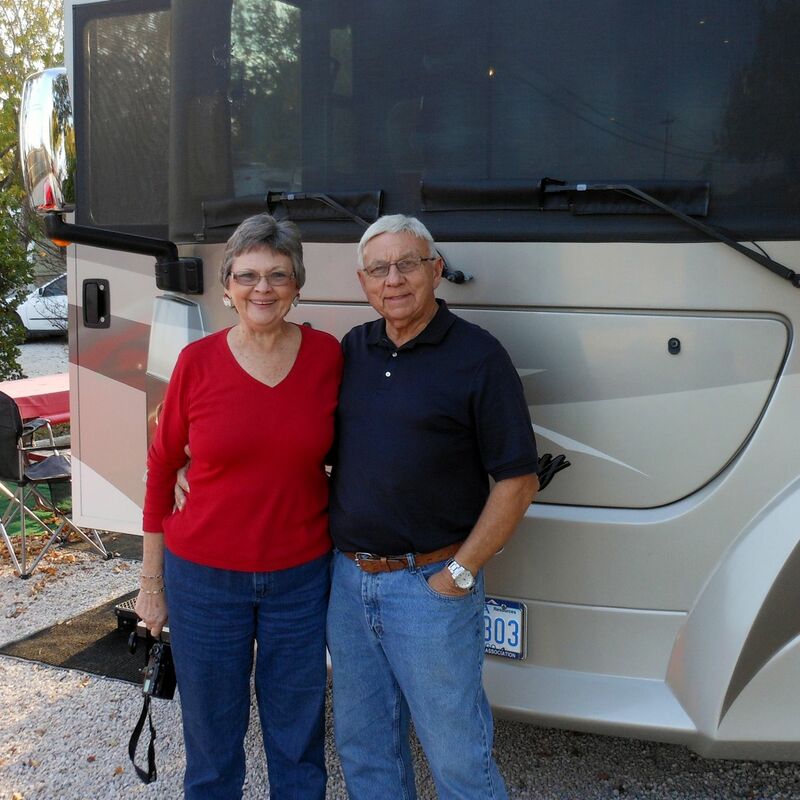 This morning, they loaded up their beautiful new motorhome and headed out just a couple of hours ahead of us. We wish our new friends safe travels back to their home in Wisconsin. And, we look forward to meeting up with them again somewhere down the road. 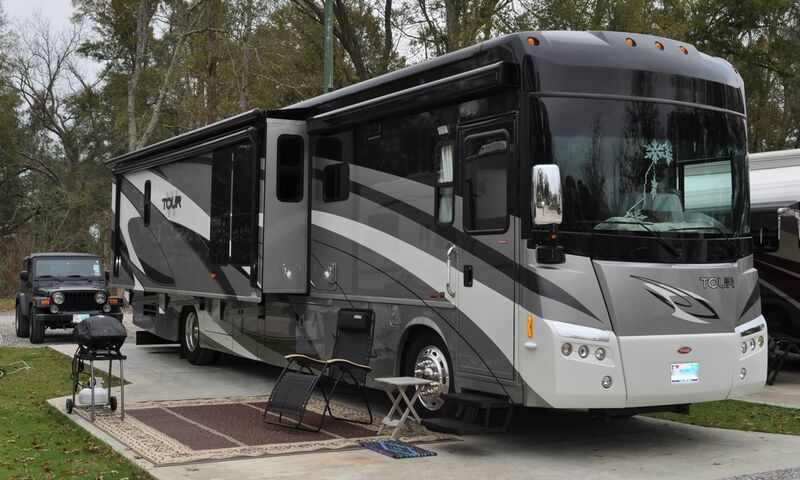 Meanwhile, we're loading up on this last day of 2011 for a short trip to the north shore of Lake Pontchartrain where we'll ring in the New Year. 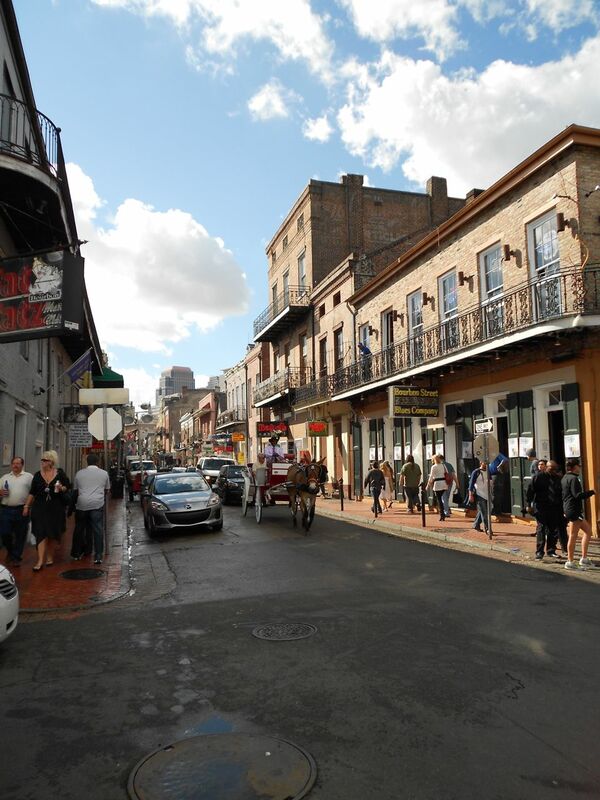 I wonder if we'll be able to hear the partyers in the French Quarter from there. With no plans to spend the holidays with family, we went in search of a place to spend a memorable Christmas. We found just that in southern Louisiana. We made our way to Convent, this tiny town along the Mississippi River that's located about halfway between Baton Rouge and New Orleans. Our home for the holiday has been Poché Plantation. Yes, we're parked on a former plantation! 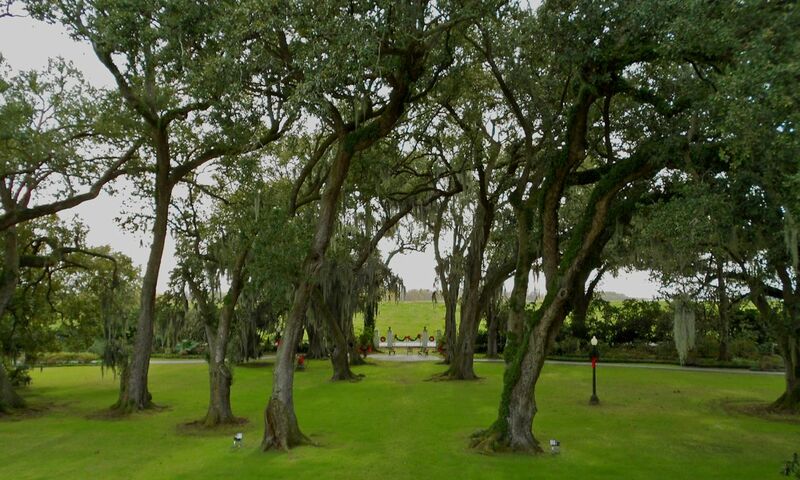 In the mid-1800s, the land upon which we are parked was a 160-acre sugar plantation. 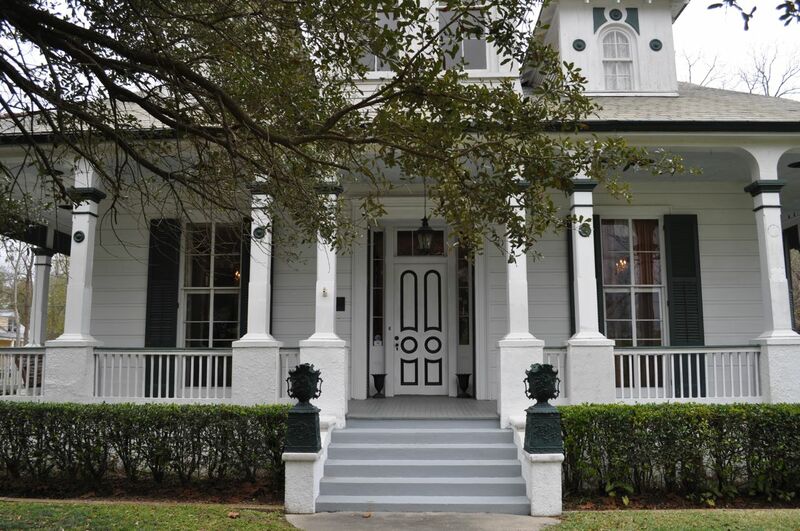 In 1867, Judge Felix Poché built this Victorian-style house, where he lived until 1882. In addition to being an accomplished attorney and associate justice of the Louisiana Supreme Court, Judge Poché went on to become one of the 100 lawyers to found the American Bar Association. The home was purchased by its current owners in 2005. 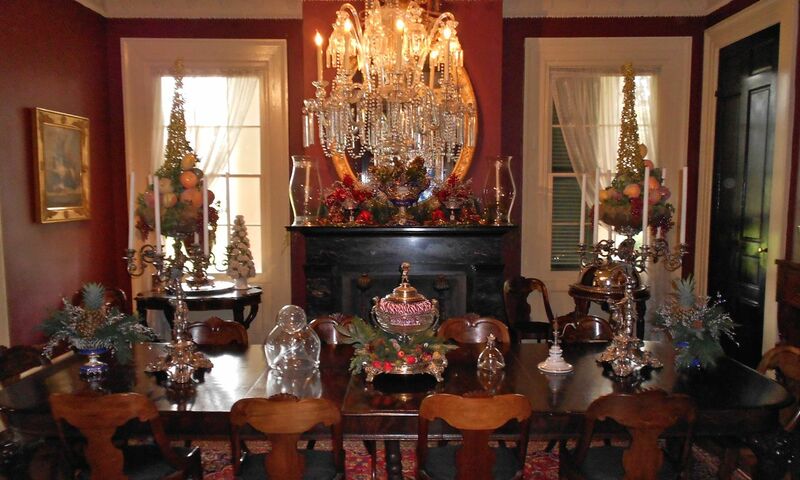 In 2006, the historic home provided shelter to evacuees from Hurricane Katrina. 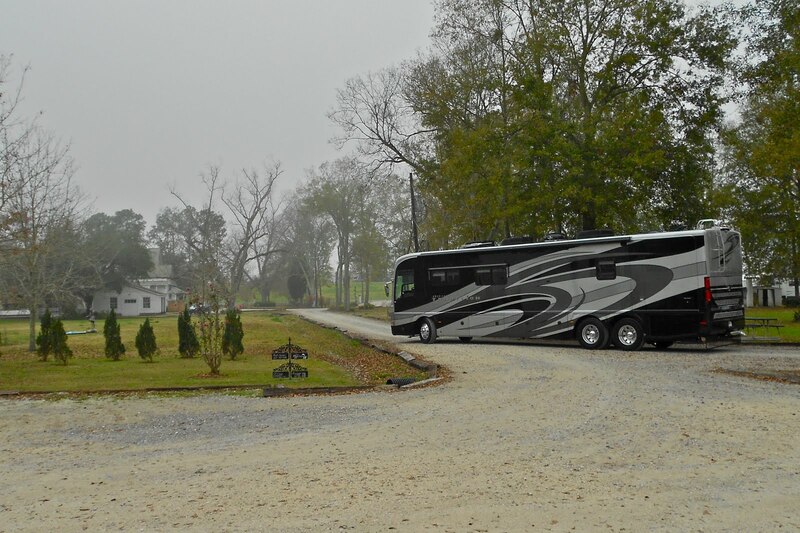 Today the grounds feature guest cottages and 85 RV sites that offer all the comforts of home. The day before Christmas, we joined owner Mark for a tour of the plantation house. Mark is quite the storyteller! He's the first to admit that at least half of what he says isn't exactly true, but it's all fun. Here it looks like Paul doesn't exactly believe the story Mark was sharing. Every plantation has at least one ghost, and Poché is no exception. 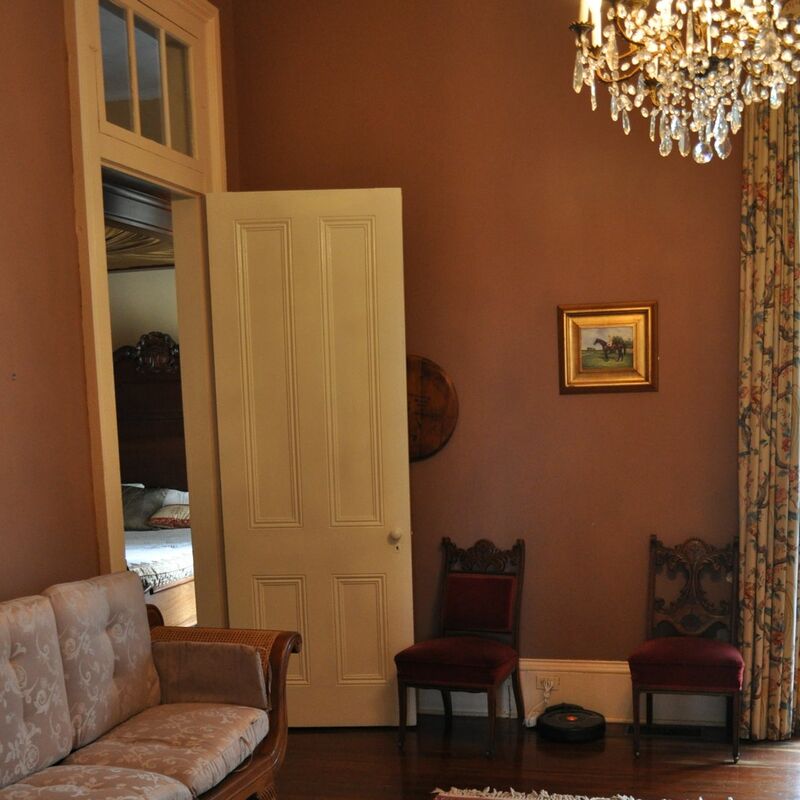 Mark explained how he saw the ghost in this room. We spotted it, too! Can you? 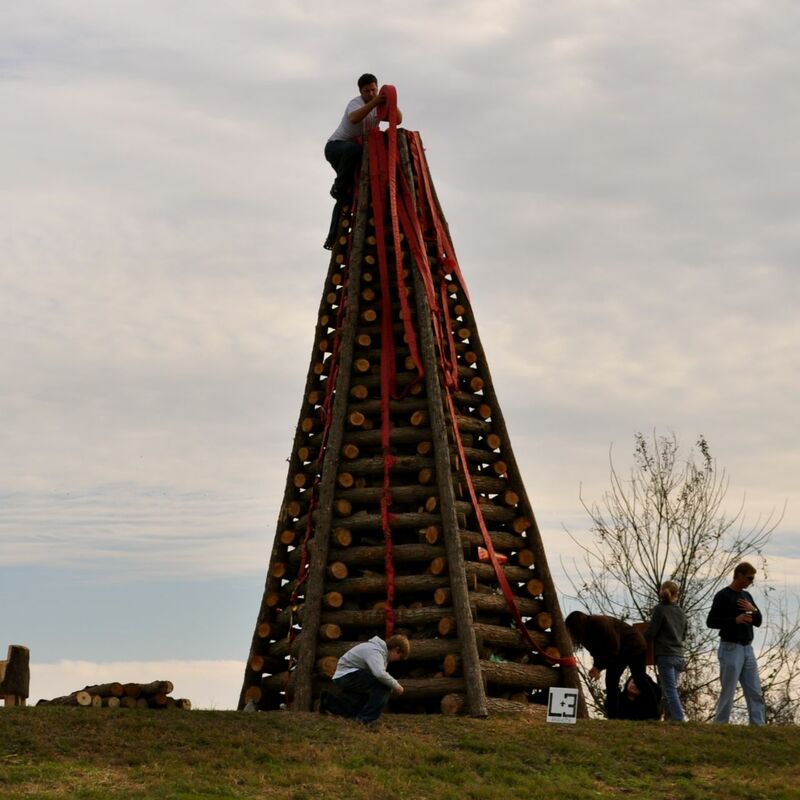 Here in St. James Parish, it's tradition to get together with your family, friends and neighbors between Thanksgiving and Christmas to build a bonfire structure along the river. 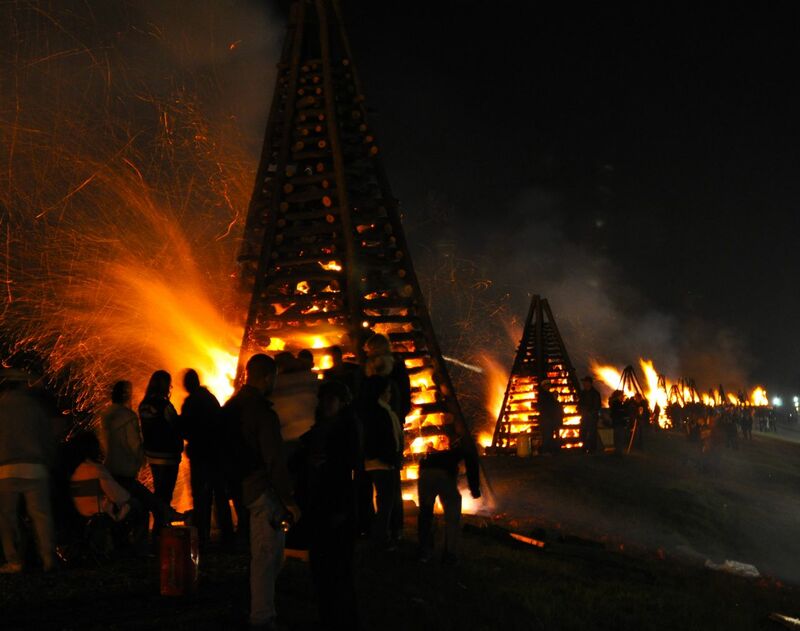 Each Christmas Eve, hundreds of bonfires are set along the river. 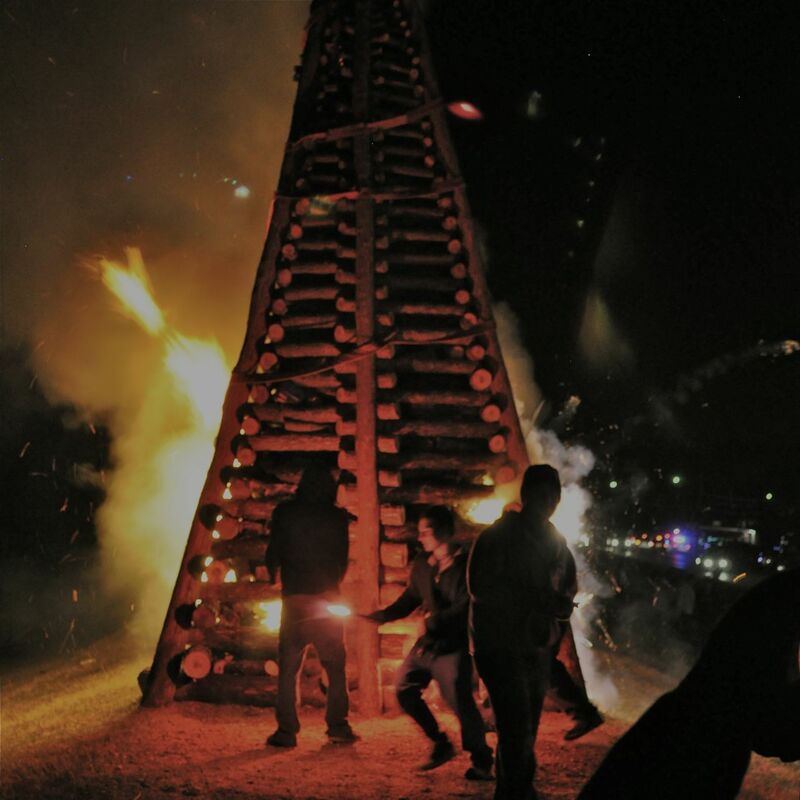 This Cajun tradition has a long and colorful history. 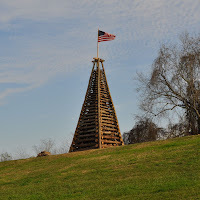 As the story goes, long ago on Christmas Eve a dense fog rolled into Southern Louisiana. The fog was so thick that Papa Noel and his pirogue pulled by eight alligators, Gaston, Tiboy, Pierre, Alcee, Ninette, Suzette, Celeste and Renee, couldn't make their way down the river. Papa Noel called on Nicolette, a snowy white alligator with glowing red eyes to lead the way, but it was still too difficult to see. 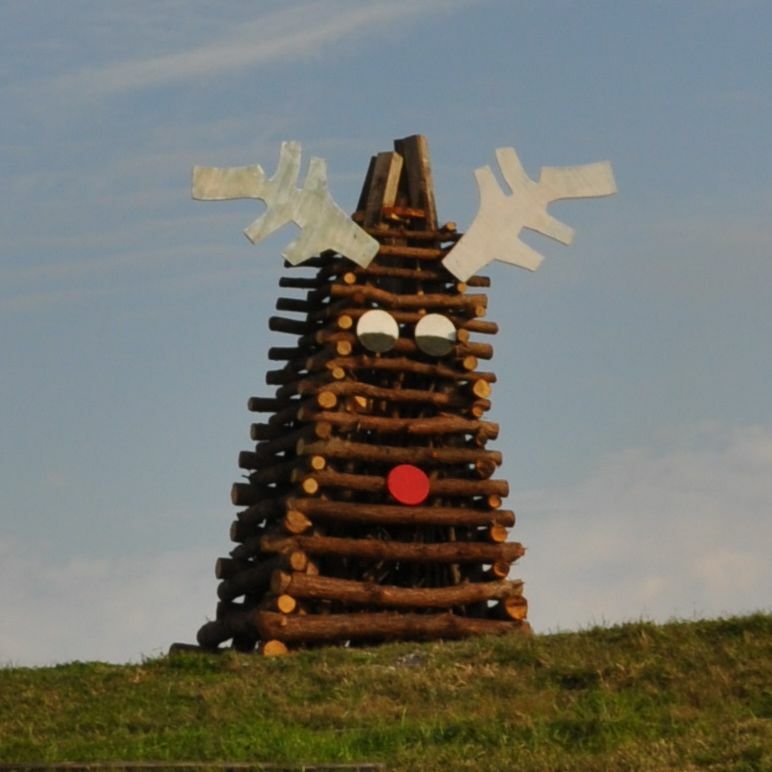 But, the people of the river parishes saved the night by building bonfires along the river to guide Papa Noel along the way. 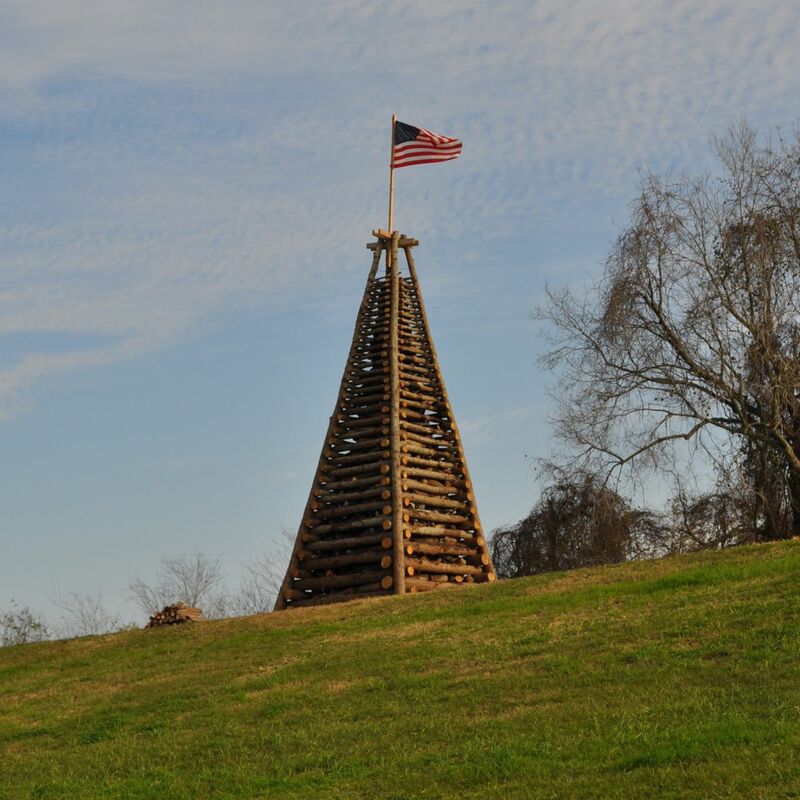 A few structures, like this giant 4-by-4, are unique feats of engineering! Our Christmas Eve began with a visit to St. Michael the Archangel Church, which is next door to the plantation. This grand church, built in the 1820s, is known for its interior grotto modeled after the famous grotto in Lourdes, France, but constructed of sugar cane. 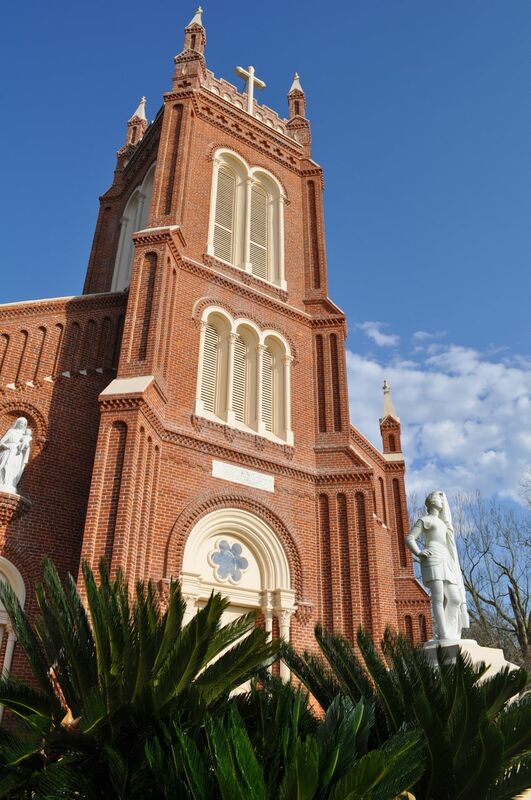 The church is also home to Louisiana's oldest playable organ, which was constructed by Henry Erben in 1857. The church is still active today, serving the needs of some 200 parish families. 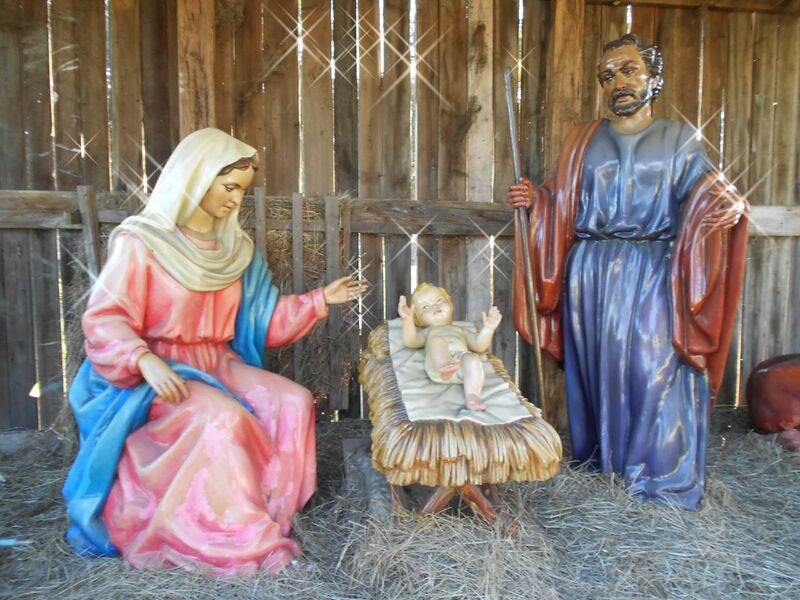 This nativity, located on the serene campus of the Manresa House of Retreats, is a popular Christmas Eve stop for visitors along the River Road. 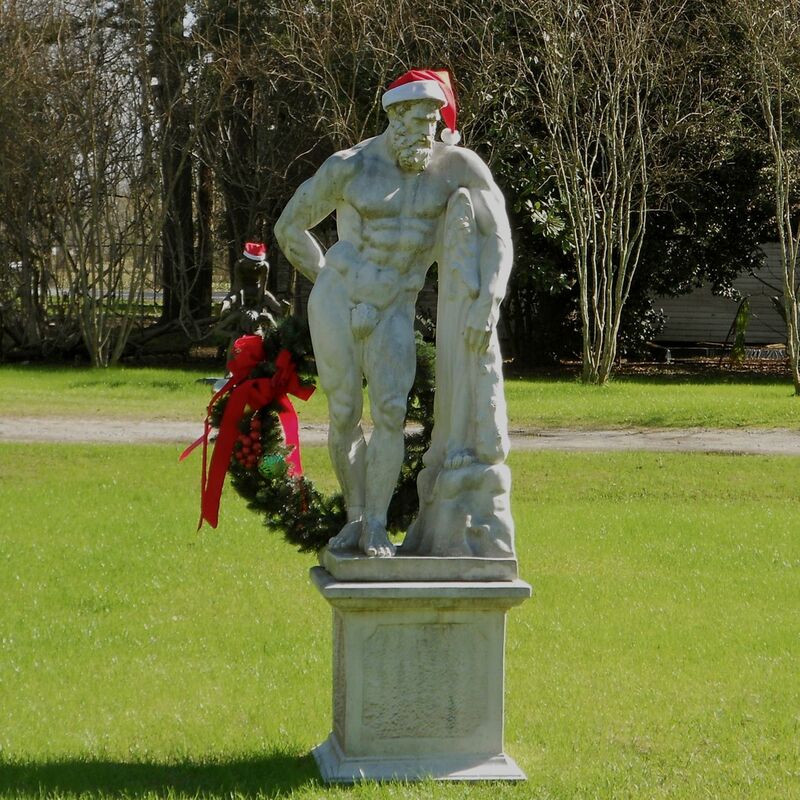 The river town of Paulina lays claim to being the birthplace of "Christmas on the River." 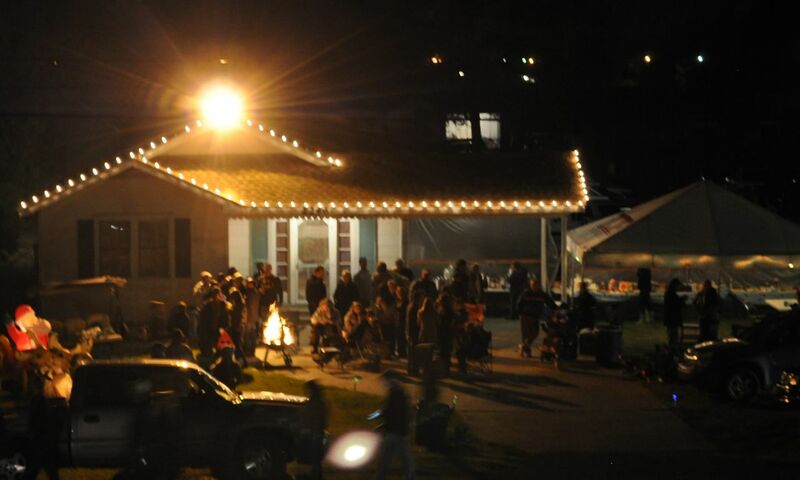 Each Christmas eve, residents along a three-mile stretch of River Road between Paulina and Gramercy open their homes to family, friends and strangers to enjoy Cajun food, music and Christmas cheer. It was all very festive. 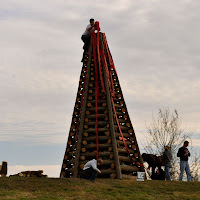 As the magic hour of 7 p.m. approached, we parked ourselves on the levee between two of the kerosene-soaked pyramids and waited for the fun to begin. The crowds and anticipation grew. We knew we were in for something special. 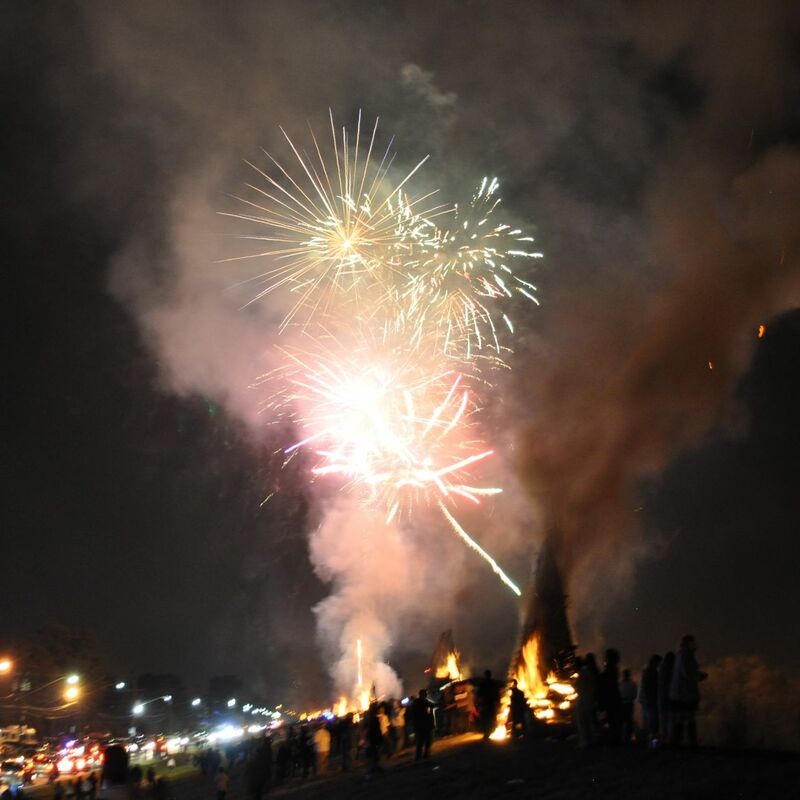 As the clock struck 7, a wave of cheers, fireworks, flame and smoke made its way up the river. Our "neighbors" went to work setting their creation ablaze. Suddenly we were standing between two flaming towers with firecrackers shooting every which way! 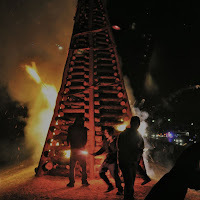 After the initial excitement of the lighting, the bonfires provided a festive glow along the river as we made our way back to our rolling home. 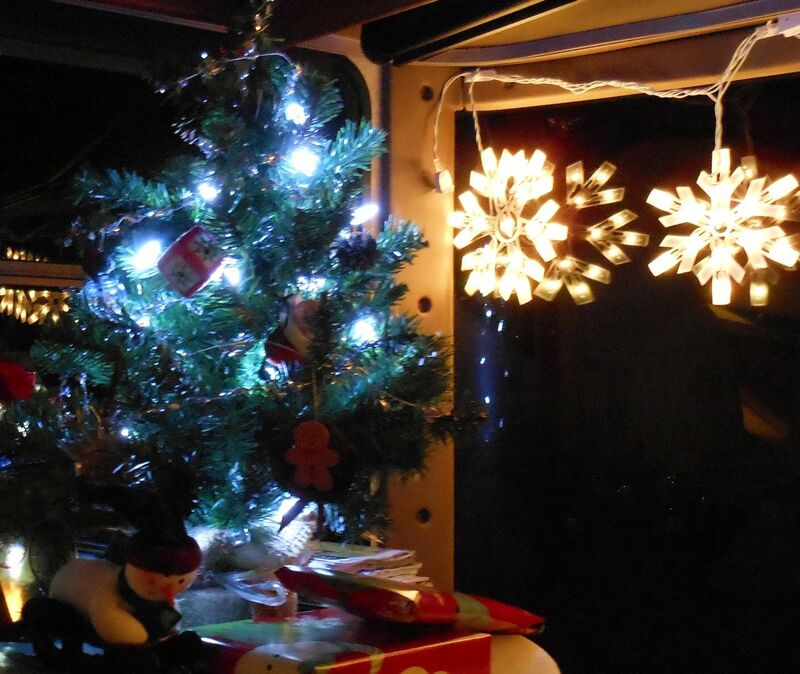 With our snowflake lights and tiny tree, Bullwinkle was looking quite festive. 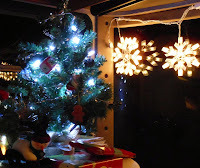 One of the presents under our tree was a new point-and-shoot camera for me. 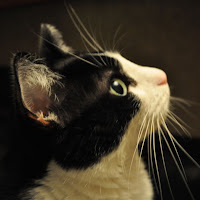 I had fun practicing with the "pet portrait" setting. Doesn't our girl kitty look angelic? 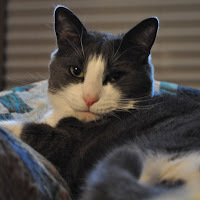 Here's our boy kitty doing what he does best: relaxing! Our Christmas Day was quite relaxing. 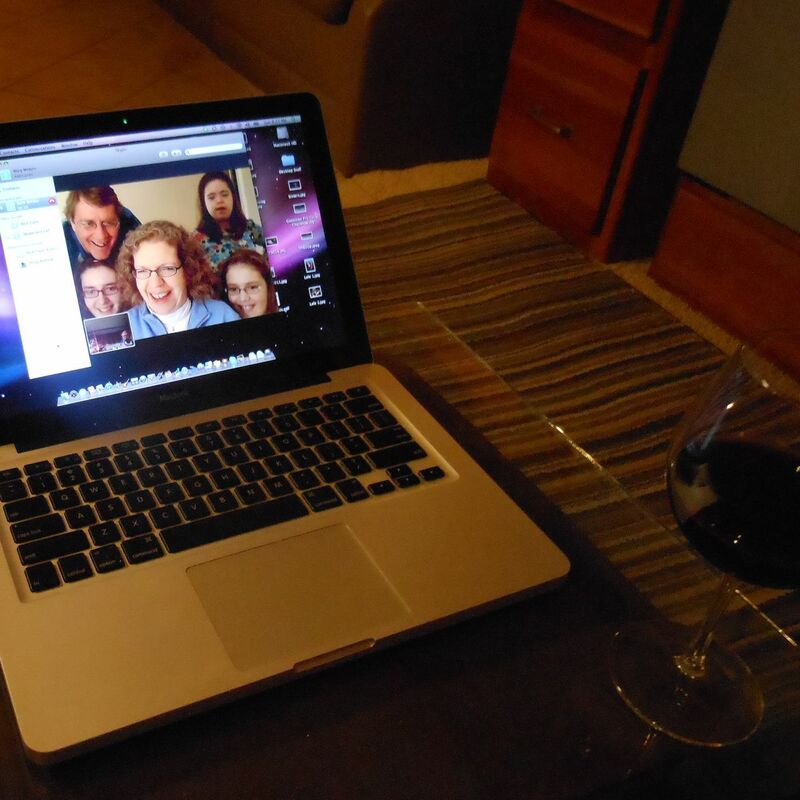 After our celebratory dinner, we enjoyed a Skype call with Paul's brother and his family. 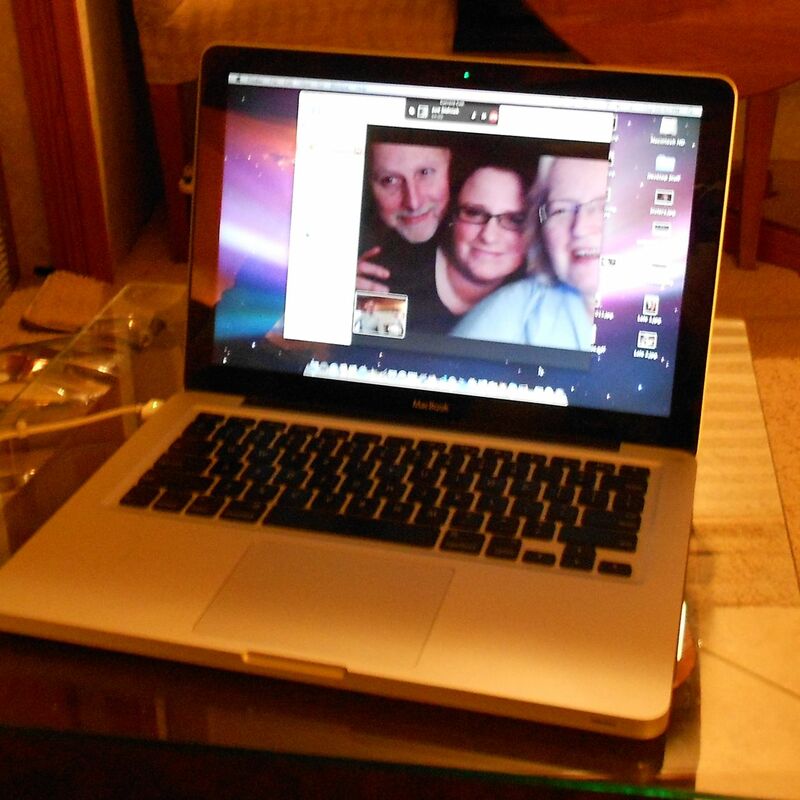 It was their first time on Skype, and the group asked if they looked like "The Brady Bunch". 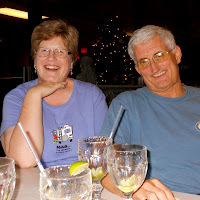 We did see some similarities, but most of all it was fun to spend some holiday time with them all. 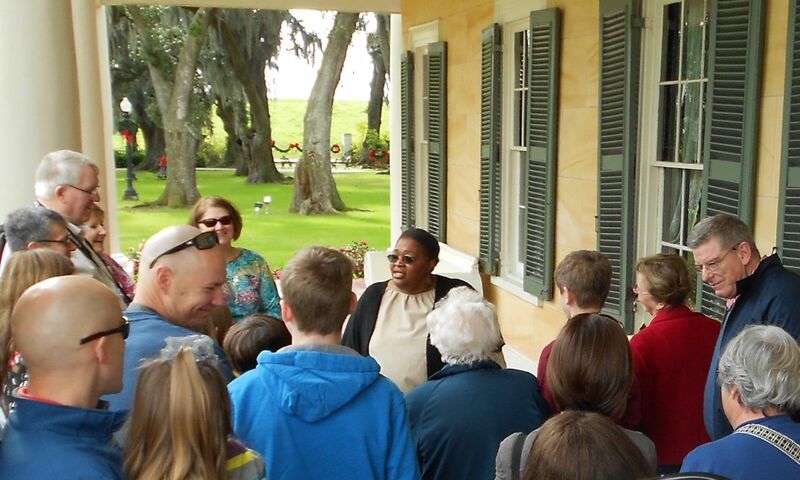 There are several historic plantations in the area that are open for tours. 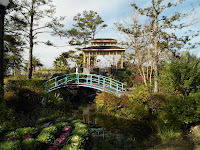 Yesterday, we visited Houma's House Plantation and Gardens up the road in Darrow. 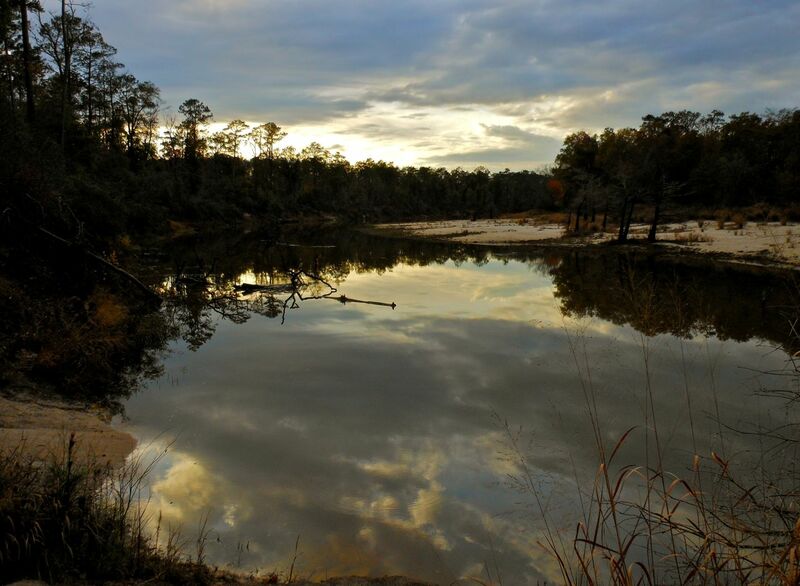 This lovely spot is named after its first owners, the indigenous Houmas Indians. Construction on the mansion was completed in 1828 by Colonel John Preston and his wife Caroline. By the late 1800s, the plantation was producing 20 million pounds of sugar each year. Houmas House fell into disrepair after the Great Depression. 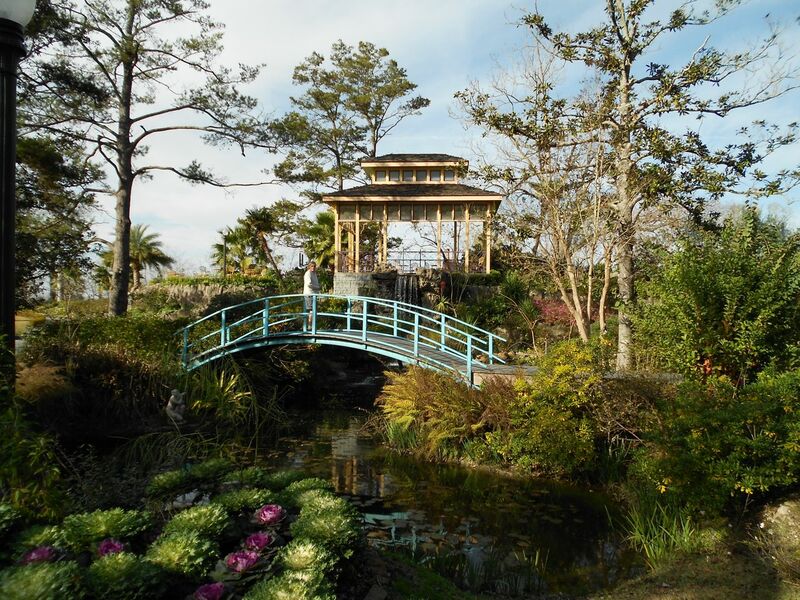 Dr. George Crozat purchased the place in 1940, renovated it and opened it tourists. In 1963, the house was the setting for the Bette Davis film Hush, Hush Sweet Charlotte. 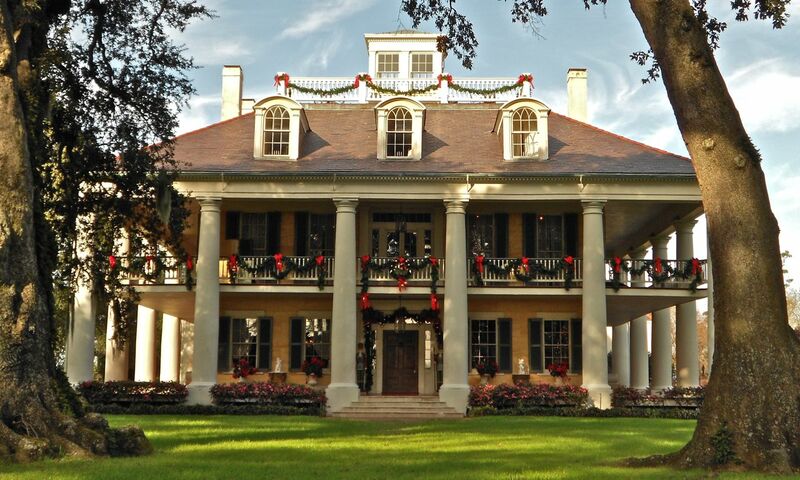 New Orleans businessman Kevin Kelly purchased the house in 2003 and restored it to its 1840 splendor. This is a special time to visit Houmas House. The spirit of Christmas can be found everywhere. Our tour was led by Miss Judy, who educated and entertained everyone and invited us to really get to know this special house. The interior was beautiful, festive and homey. 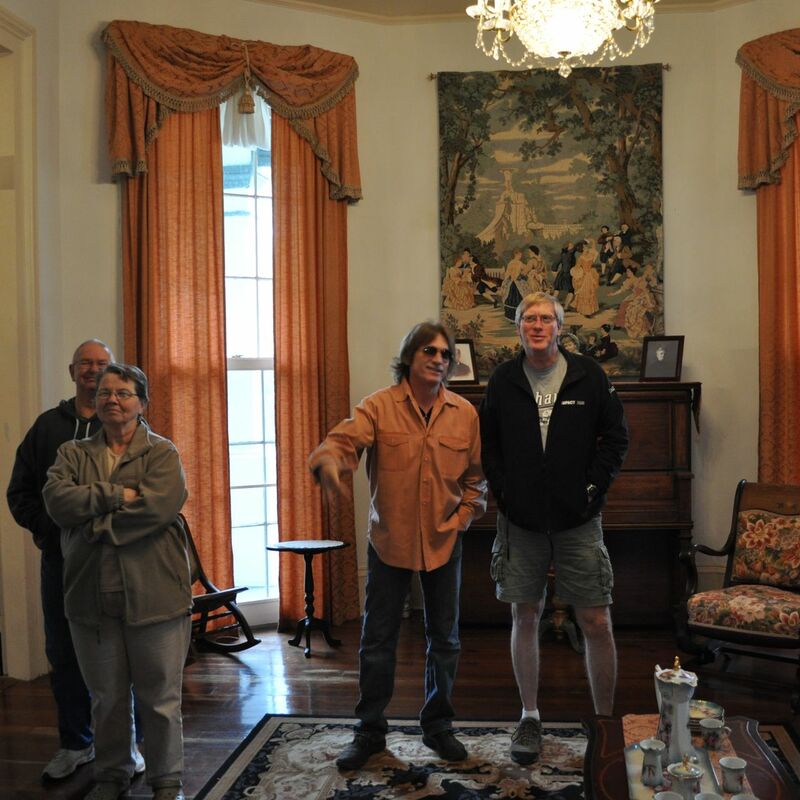 In addition to being a top tourist attraction, Houmas House is actually Mr. Kelly's home. 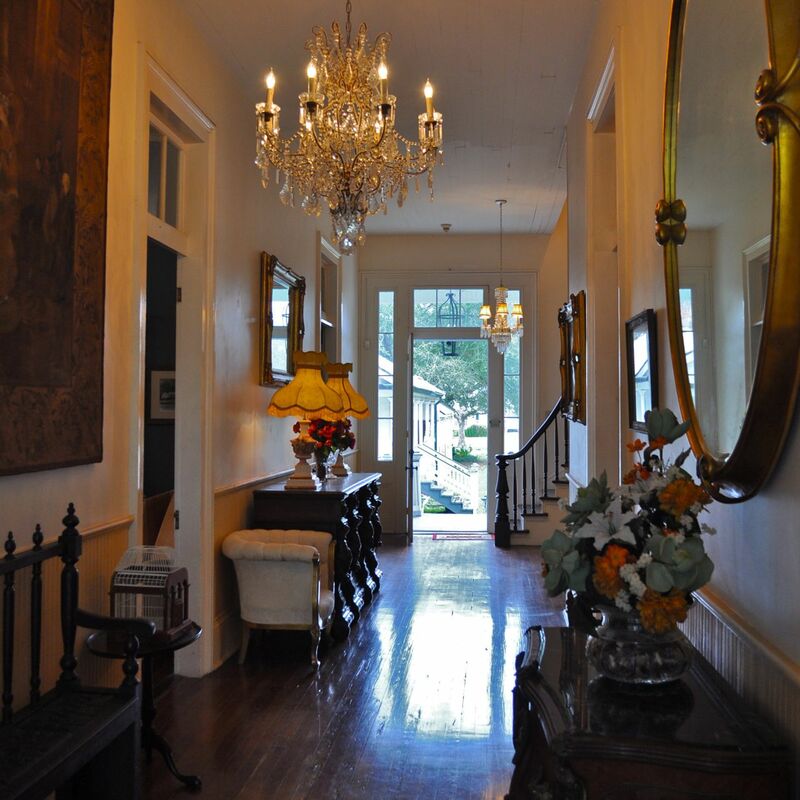 The front yard of the house is graced with a lovely alley of centuries-old oak trees. After our tour inside the house, we wandered through the expansive gardens on the property. Even in winter, these outdoor spaces are beautiful. 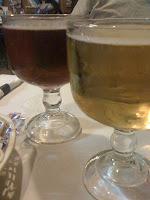 We also enjoyed a nice lunch at Houmas restaurant. Tonight we wandered up the road to another hole-in-the-wall, Hymel's. 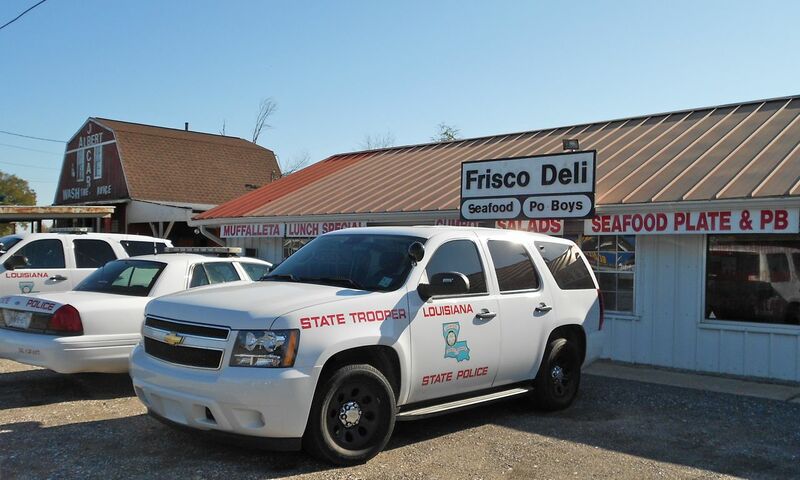 Every Thursday night, this 60-plus year-old local spot serves up an endless helping of fresh boiled shrimp and fried catfish. Yummy stuff! 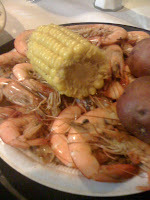 Our tasty seafood was accompanied with a "fishbowl" of ice cold beer and live Cajun music. Life doesn't get much better! After dinner, our friends Sue and Doug checked in on us from British Columbia. 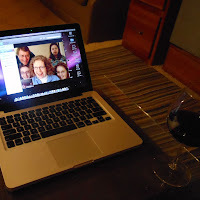 On Skype (our new best friend) we exchanged holiday greetings and caught up on each other's latest news. We even got to say hello to their daughter Carlie. It was great to see everybody! 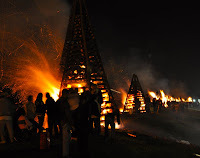 After a most enjoyable holiday week on a plantation, filled with bonfires, music, tasty food and virtual visits from family and friends, our Cajun Christmas is definitely one to remember. 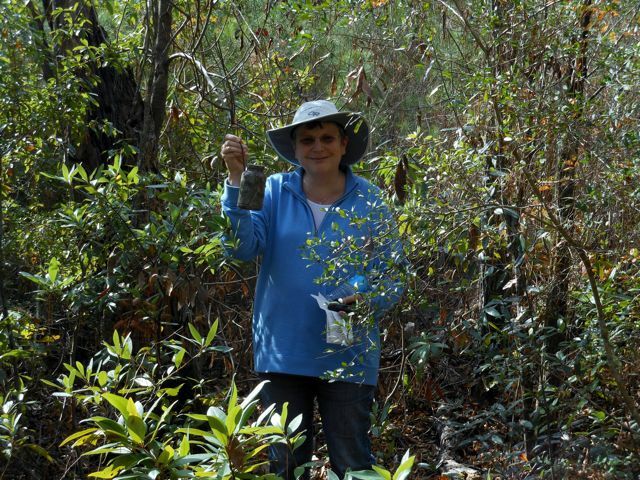 The Big Thicket is the name of a heavily forested area in Southeast Texas. And, we're sitting in the thick of it. 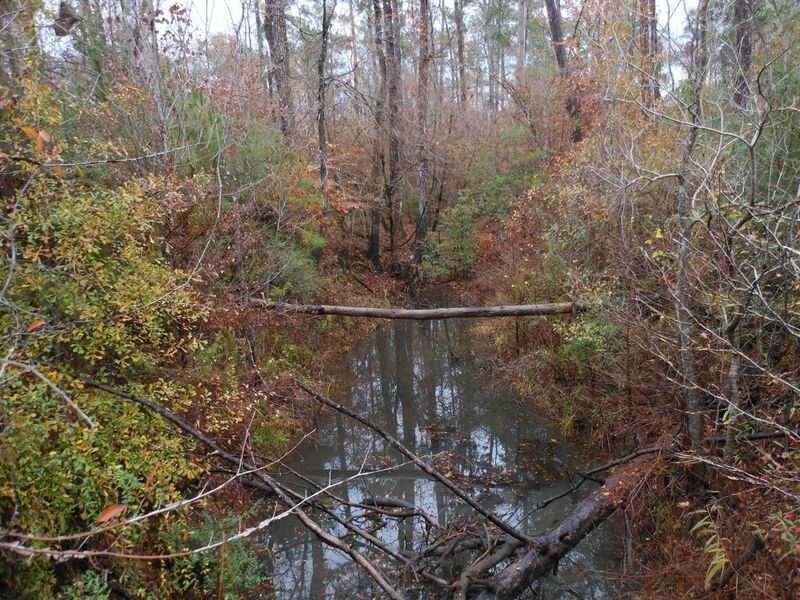 Village Creek State Park is located in the town of Lumberton, which is about 10 miles north of Beaumont. Other than that, there's not much to say about this area, except that we like it! "One's fondness for the area is hard to explain. It has no commanding peak or awesome gorge, no topographical feature of distinction. Its appeal is more subtle." 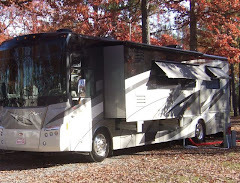 The park has a small campground with 25 sites. 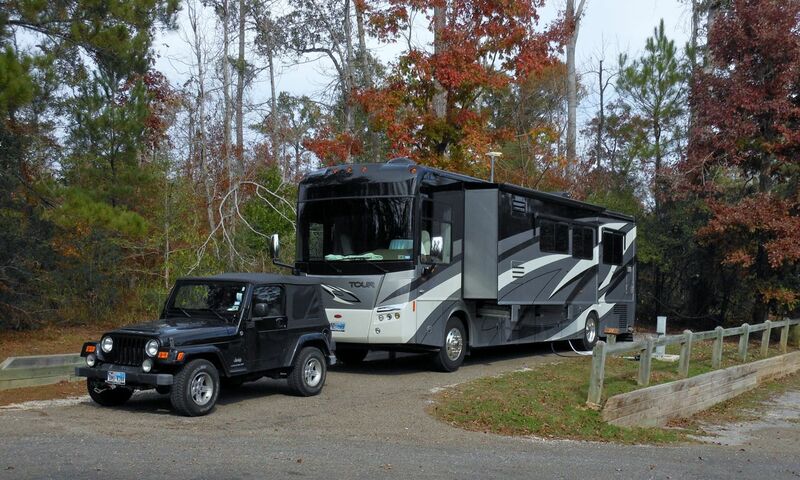 With just a camper or two in the neighborhood, we practically have the place to ourselves. We were planning to spend a couple of nights here. But, we like it so much we extended our stay to five quiet and peaceful nights. Our boy kitty likes this spot, too. 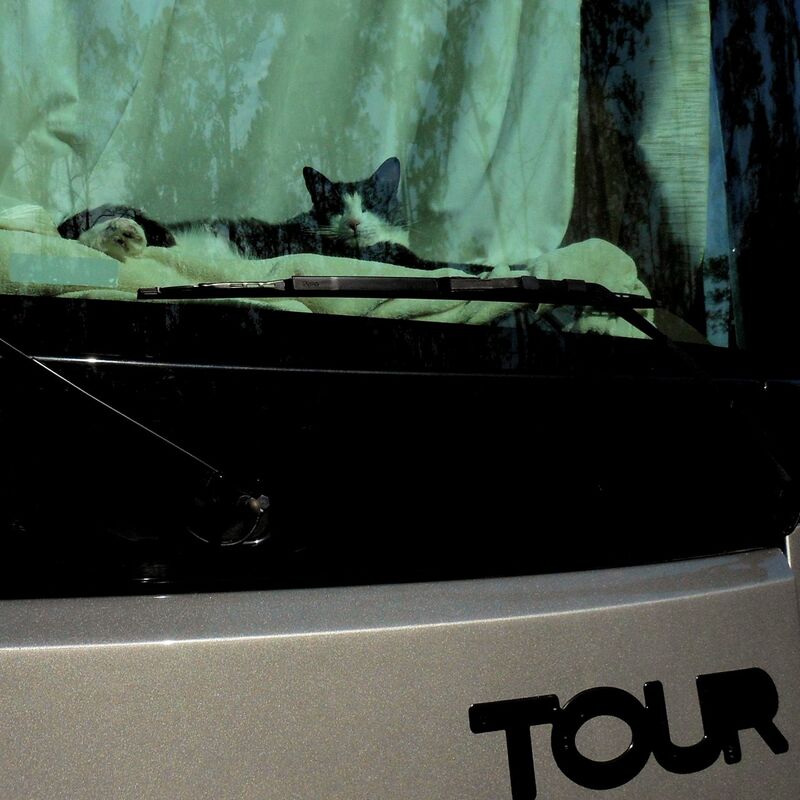 He has spent much of his time sunning himself on our south-facing dash, collecting compliments from passersby. 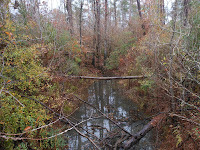 Village Creek State Park features several hiking trails. After our recent "food fests", we've enjoyed some long walks during our stay. 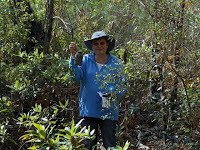 Along the way, we've found a geocache or two. 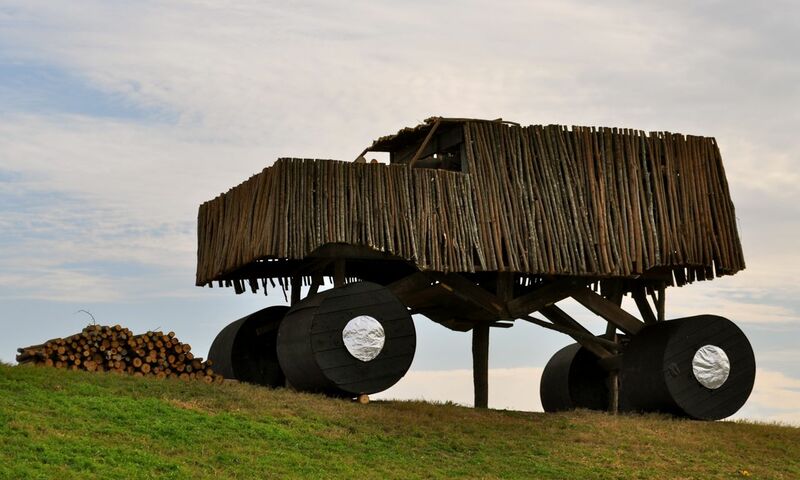 This was one of the most creative geocaches we've ever found. 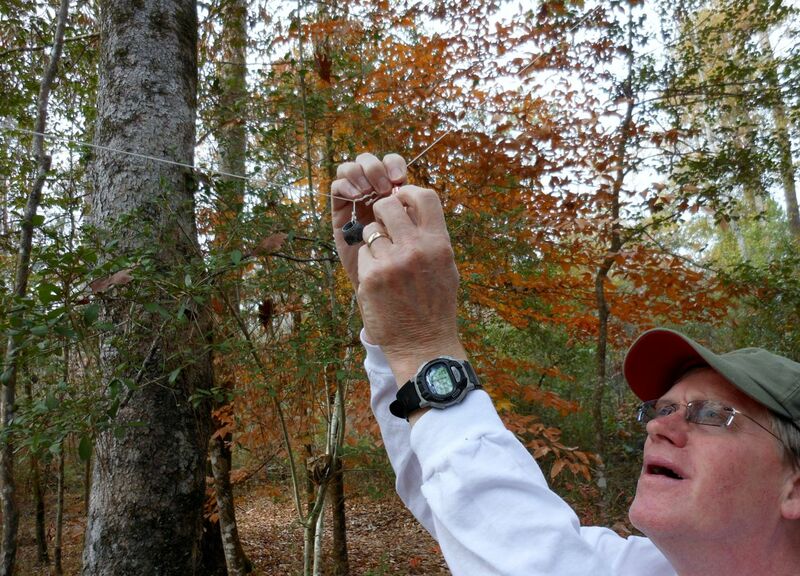 This tiny capsule was on string between two trees here in the thicket. Yes, it was a bit like searching for a needle in a haystack! 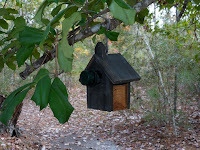 Paul spotted this creative cache near the park's nature center. 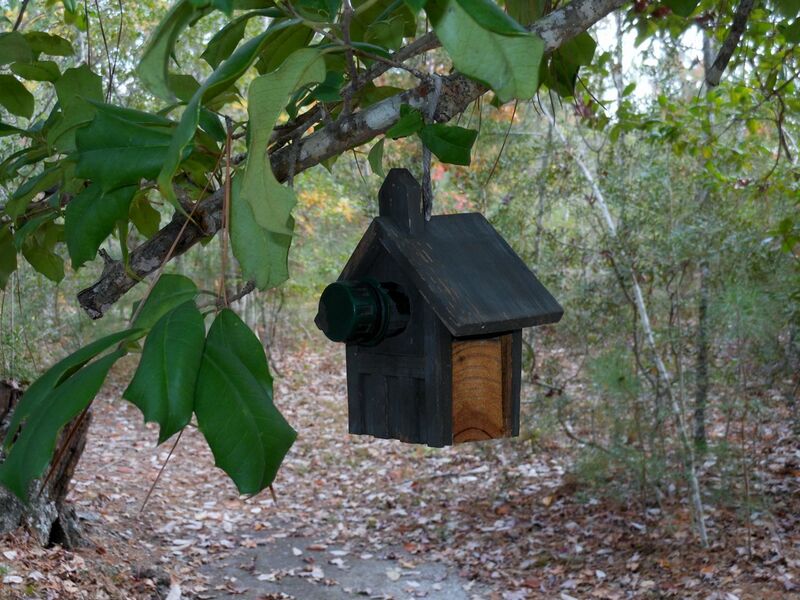 It made us wonder how many birds have been turned away because there's no room in this "inn." After a couple of fun-filled weeks in our adopted home state, we're heading east tomorrow to spend the holidays in Louisiana. It's been great to be back in one of our favorite places in Texas, the capital city of Austin. 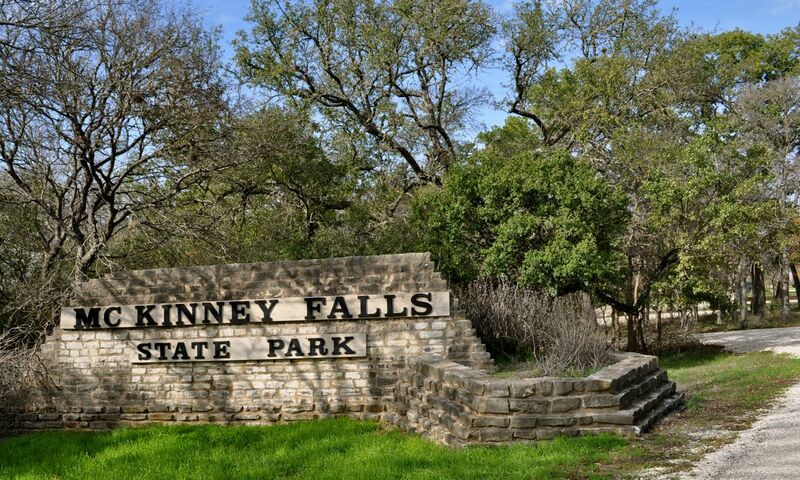 We decided to put our soon-to-expire Texas State Parks Pass to work and made our home for the last five nights at McKinney Falls State Park. 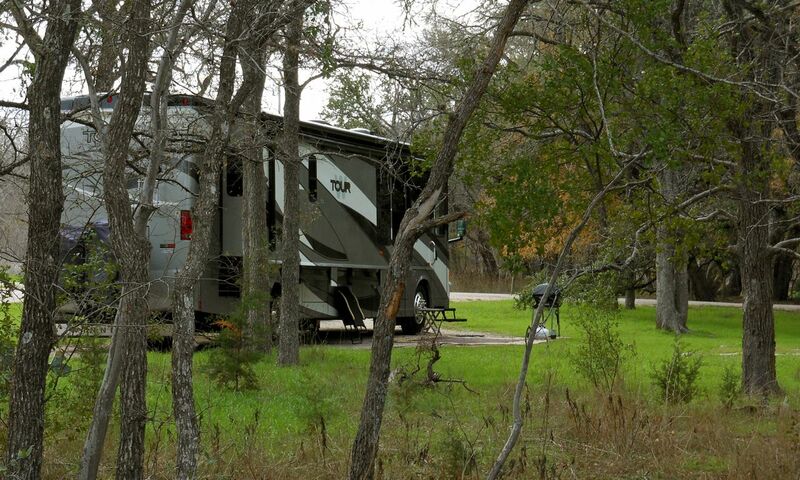 This spacious campground offers the comfort of a state park with the convenience of the city. Downtown Austin is just 20 minutes away from our peaceful and quiet spot. We're certain this park is packed much of the year, but things have been pretty quiet during this December week. 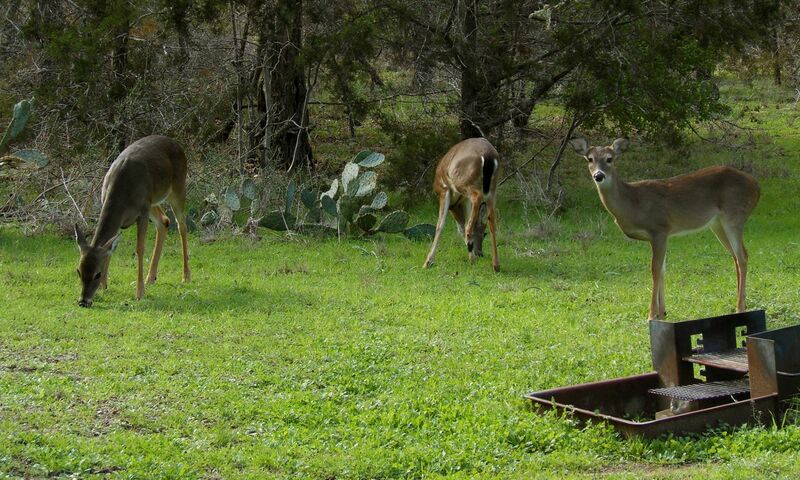 Deer have definitely outnumbered the campers in our neighborhood. Hey! 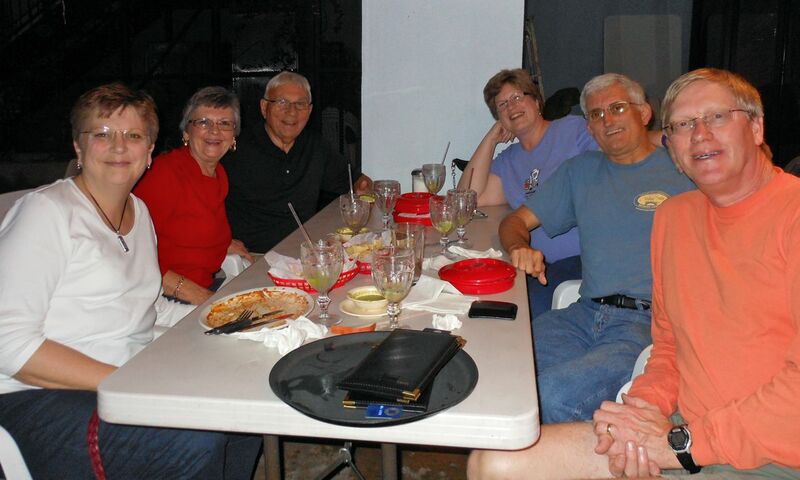 We know those folks behind the empty margarita glasses! We're tailing friends Cathy and Steve through Texas. It was great to see them again before they head for points south. Cathy and Steve are staying at the same park as our special friends Francile and Gary. We just love it when our friends meet our friends! We all got together for tasty food and drink at a wonderful hole-in-the-wall Francile and Gary introduced us to on our previous visit to Austin. We met Francile and Gary at this Austin park in April 2010. Our paths have crossed several times since, but it was great to see them again where it all started. 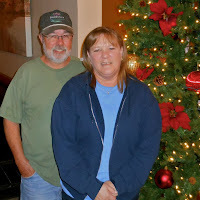 We hope they enjoy a warm and wonderful winter stay here in Austin. We look forward to seeing them in Iowa next Spring. 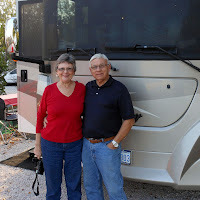 We made a quick road trip down I-35 to San Marcos where we met friends Rod and Deb for lunch. Over tasty German food, we caught up with each other's adventures over the last year. They are hanging out near family in San Antonio for the holidays and then some. We hope they have a great visit, and we look forward to seeing them down the road. Tonight, we enjoyed a wonderful dinner downtown with Paul's cousin Cynthia, husband Tim and son Ben. Between the good food and fun conversation, we didn't manage to take any pictures. Well, then, we'll just have to come back! Tomorrow, we're heading east to another Texas State Park. We love 'em!